“Here you can go from Paris to Cuba in just a few blocks,” explained Romina, our hip, motorcycle-riding Argentinian tour guide as she escorted us through the leafy but chaotic Buenos Aires streets. While I experienced less of the Cuba side and much more of the Paris side, Buenos Aires and its many delights took me completely by surprise. Being a Southern California native, I was expecting a city resembling Mexico, but what I found instead was a thriving, modern, European-like metropolis. 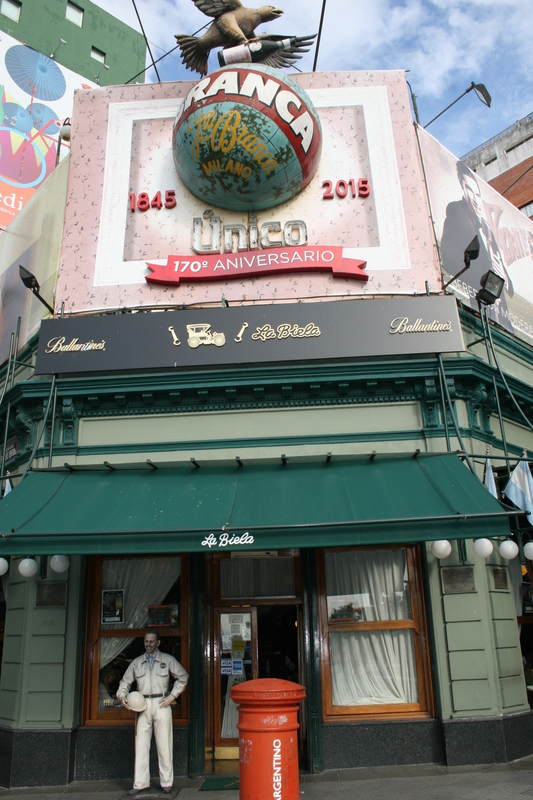 In fact, Buenos Aires reminded me so much of my Italian family’s home base of Bari, that it felt instantly familiar. Sometimes referred to as “the Paris of South America,” Buenos Aires is home to roughly three million people, 13 million if you include its surroundings. It has the highest concentration of theaters in the world and, in my humble opinion, possibly the highest per capita rate of delightful cafes in the world. Portenos (People of the Port), as Buenos Aires citizens are called, enjoy the third highest quality of life of all Latin American cities, and this capital of Argentina attracts more visitors than any other city in South America. During my two-week stay in a centrally located home, I began to feel like a resident. And without a demanding schedule, a lovely routine was born: wake slowly, find a spot for my morning cafe con leche and medialuna, tour and wander until afternoon, find another cafe, rest, eat a big, rich, late dinner, as is the Argentine (and Italian) way. Buenos Aires is a walkable city, flat and accessible. It felt safe, although even the locals heed basic precautions such as carrying a cross-body bag or backpack worn in the front, and just generally being aware of one’s surroundings. Although I did not catch a tango show, often a top attraction for tourists, I did manage to visit many of the hot spots in town. Here they are below, in no particular order, all are recommended if you are planning a visit. Yes, you read that right. One of the not-to-be-missed spots is a cemetery, but not just your average eternal resting spot, for housed in Recoleta are some of the heavy-hitters of Argentine history, including Eva Peron (admittedly, the only name I recognized). Recoleta sprawls like a little city in itself, and is equal parts peaceful, majestic and eerie in its crumbly elegance. Reminiscent of the California missions, this basilica, built in 1732 by the Monastery of Recollect Fathers (the Franciscan Order of monks for which this entire upscale neighborhood of Recoleta is named), is how I expected all of Buenos Aires to look. In the shadow of the church and cemetery is La Biela, which I, in my wisdom, avoided in my first days, thinking it must be very touristy and overpriced. Until the Argentinian native who coordinated our trip urged me to go to this famous, historic cafe. I feel pretty confident in saying that here I found the best cup of coffee I have ever had (sorry, Italy! ), and I’m a bit afraid that I may spend the rest of my life in search of something as delicious and perfect as the cafe con leche and medialuna (all for $5) that I found here. Plan to spend a few hours in this area of town, sipping a coffee or enjoying a meal at La Biela, wandering through the alleyways of the cemetery and finding peace and solitude in the church. Travel on an overnight flight from San Diego to Argentina deposited us onto the South American continent understandably weary and sleep deprived. Perhaps that’s why, upon entering the El Ateneo bookstore across the street [Calle Santa Fe] from my accommodations, I hadn’t noticed that I had passed under a theater marquee in order to enter the store, nor the full name of the store displayed on said marquis: The Grand Splendid El Ateneo. I loved this bookstore from the moment I set foot inside, but as I made my way to the back, I began to realize it was much larger than it first seemed. What a relief the books were libros en espanol for, were they libri italiani o inglese, I would have been in big trouble. The café at the back of the store drew me to it like a beacon. I thought it was a unique feature that it was raised and flanked by beautifully swagged merlot colored velvet curtains. I noticed how incredible the interior of the multi-level building was, and saw people reading their books in what appeared to be box seats, something like you’d see at the theater. But it wasn’t until I was standing in the café, looking back toward the front of the bookstore, frescoed ceiling above me, when the grand splendidness of the El Ateneo hit me, for the café was actually a stage, and the El Ateneo was a former theater. Quite accidentally, I had discovered what The Guardian has named as the second most beautiful bookshop in the world. Really, if you love books and you find yourself in Buenos Aires, set aside some time for this destination. It was amazing, and I popped in almost every day during my stay, just to say “chau”. If shopping for books in Spanish works up an appetite and you are looking for a delicious, well-priced and authentic Argentinian meal close by, Cumana Restaurant is your spot! 1149 Rodriguez Pena just off Santa Fe, and easy walk from El Ateneo. Speaking of theaters, you won’t want to miss this one, whether you are watching a show (we saw Swan Lake – Lago de los Cisnes) or simply taking a theater tour. The acoustic of this theater, which opened in 1857, are so good that the Colon is ranked as one of the five top performance venues in the world. Being that I favor Renaissance and Impressionist art, this museum was a favorite. I spent a long and lovely couple of hours here, wandering the hallways and enjoying the artwork (pieces by Monet, Manet, Van Gough, Degas). It also features an extensive collection of artwork by important 20th century Argentinian artists. Entrance free, check the website for hours and current exhibits. Other museums you may want to visit: MALBA, Eva Peron Museum, Palacio Paz. One of the main squares of the city, and the gathering place for Portenos when they have a reason to celebrate, mourn or protest. Lining this square are some of the most notable buildings of Argentina, including Casa Rosada (home of Argentina’s president and the famous balcony where Eva Peron addressed her adoring public); the Metropolitan Cathedral of Buenos Aires (home to Pope Francis when he served as Archbishop of Buenos Aires, and a must-see if you enjoy visiting beautiful churches as much as me); and the Cabildo, a remaining building from Argentina’s colonial days which housed the government and now serves as a museum. A short walk from Plaza de Mayo finds you at July 9 Avenue, the widest avenue in the world (seven lanes in each directions flanked by two parallel streets!) Take your time and exercise caution while crossing, but it is something not to be missed. Here one can spot Buenos Aires’ famous obelisk (Obelisco). The avenue is frenetic and lively, but to me, visiting this section of the city reminded me of the first time I set eyes on the Leaning Tower of Pisa: if you’re coming all this way, you just need to see the Obelisk and this avenue in person. This area is great to visit on a Sunday if you are looking for fantastic , authentic street fair finds. Save some time also to explore the antique galleries which are a little hidden but hold a treasure trove of goodies. It seemed harmless during my two daytime visits, but I would be cautious in visiting at night. That’s just my opinion. How can one not be immediately captivated by this colorful, edgy section of town? All the tourists guides warn visitors to exercise caution and to not wander off Caminito Street — heed these warnings. While Caminito Street is preserved as a known hot spot for tourists, and an easy place to catch a tango show, the surrounding streets are actual neighborhoods where people live, and, to be perfectly honest, tourists can quickly become targets. I was happy to have seen La Boca (“the mouth” in both Spanish and Italian), but I was relieved to be their with a local guide. Your pictures promise to be fantastic, but be sure to hold on to your camera tight! As much as I enjoyed being a city girl for two weeks, I appreciated the opportunities to venture away from the city and its hectic pace. My gracious hostess took me to visit some of her family in San Isidro, about a 20 minute drive outside of the city — fantastico! Our group spent a few lovely hours in Tigre, about an hour drive out of the city — magnifico! And we had a wonderful weekend in San Antonio de Areco (2 hours by car from Buenos Aires) at Casa Bella Vista, a traditional countryside estancia. In this hacienda-style bed and breakfast there are just a few main focuses: 1. EATING, 2. Relaxing and 3. Enjoying the company of your fellow travelers (which, in my case, happened to be Older Son and some of his closest friends, all of whom I adore). And even though the accent is a bit different, Buenos Aires is an ideal place to dive into learning Spanish. Our trip was coordinated by VOS School, which I endorse whole-heartedly (and “unsponsored-ly”). Have you ever turned up in an unexpected destination, and as a bonus, been pleasantly surprised by that locale? Please share with us in the comments below! Whatever journeys are in store for you this summer, I wish you happy and safe travels! All images my own unless otherwise noted. This post first appeared on Prayers and Piazzas. Tags: Argentina, Buenos Aires, El Ateneo, La Boca, Recoleta, San Telmo, Things to do in Buenos Aires. Bookmark the permalink. Good job mom! I WANTED TO COME WITH YOU!!!!!!!!!! You are usually my traveling buddy! Wow, I am so glad you had a good experience. I have only been to South America one time. I went to Quito, Ecuador and to a remote island in the middle of the Puyo river We took a bus ride from Quito to a small city where we had to then take a small (really small) boat to this island. We were the only group of about 25 of us there. We had no electricity but we were fortunate to have cold running water. The huts had to be high off of the ground in order to keep the bugs out. We went to a witch doctor and did a lot of trekking. I am so happy that you sparked my memory, I can’t remember the name of the place but I am going to research it and try to find my pictures. Oh how I love to travel and miss it so much. Makes me want to visit. Will have to live vicariously!! Thank you for all the support back home! !